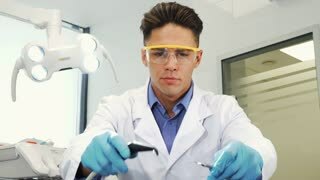 Search Results for "dentist pov"
Point of view shot of a handsome male professional dentist working, examining teeth of the viewer. 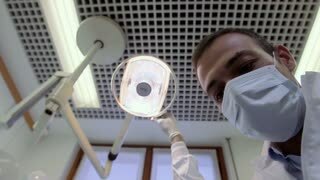 Dentist performing oral examination using dental medical equipment. Smile, teeth concept. The dentist checks the mouth using tools. Point of view of patient in chair. Dentist's in medical glasses treat patient. Point of view ortodont. 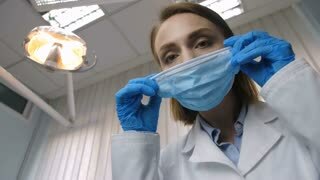 Woman at the dentist chair gets dental medical examination and treatment. POV low view shot. Odontic and mouth health is important part of modern human life that dentistry help with. Two doctors men and women inspect patient and the light a lamp POV. Professionally, med tools at the beginning of the frame. 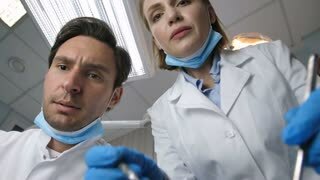 Doctor, dentist, directs the light bulb in the camera, looks in it. The view through the eyes of patient. Female dentist drilling tooth of young female patient at the dentist cabinet. Wide angle POV view of Laser Teeth Whitening poster stapled to pole. Urban advertising.